Are you satisfied with the official centenary of the First World War? Did it help you understand the real causes of the war, as well as the massive propaganda mechanisms that led to this butchery? In this twenty-first century, with the drums of war sounding again, it is time to highlight all these aspects. To understand the cruel reality of this war. But also to know how, against all odds, hope for a better world has emerged… The historian Julien Papp, author of “De l’Autriche-Hongrie en guerre a la Republique des Conseils (1914-1920)”, dissects a chapter of history “largely unknown in France”. Interview conducted by Alex Anfruns. 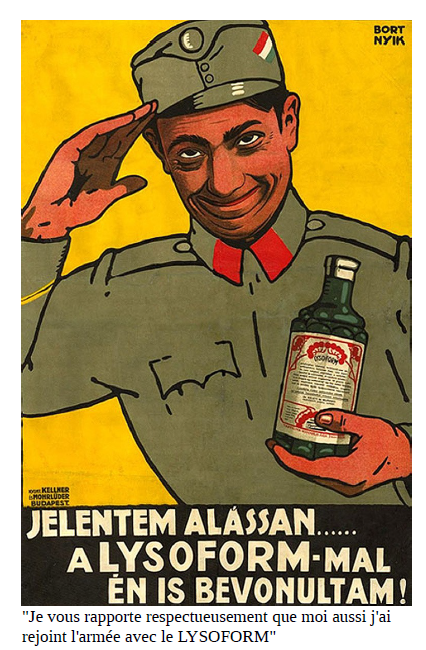 Alex Anfruns: In your book, you describe the propaganda mechanisms at work at the beginning of the 14-18 war, focusing on the instrumentalization of Hungarian nationalist sentiment. 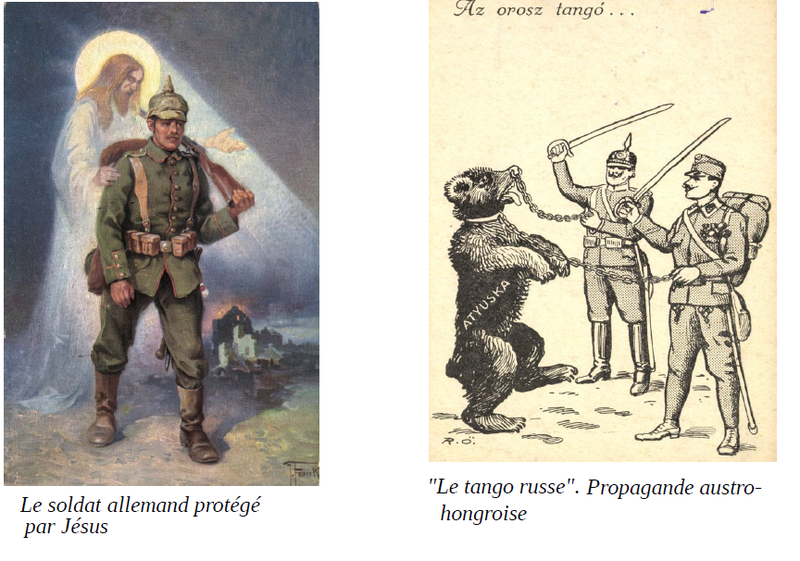 Who are the actors who took part in this propaganda against the Entente? Julien Papp: First of all, it should be noted that at the civilian power level, there was no central body in Hungary in charge of organizing and coordinating the propaganda activities. That was the mission of the “Imperial and Royal Military District of the Press” which depended directly on the Chief of Staff. It was set up on the day of the declaration of war against Serbia. The organization went through several changes that were always in line with the expansion of its skills. In 1917, it included twelve units: command, censorship, domestic and foreign affairs, propaganda, press, artists, photographers, cinema, Italian section, war correspondents, administrative apparatus. The Military District of the Press controlled the information provided by the newspapers, coordinated the various propaganda activities and organized the fight against enemy propaganda. And on the civilian side? In the hinterland, to support the war efforts of the society, two organizations were created: the Central Relief Committee of Budapest, and the National Committee of Military Relief. In both cases, it was an explicit cooperation between the state and intellectuals close to power. Finally, when we say that the machinery of war propaganda was not based on a state institution, this should not hide or diminish the importance of political bodies close to power, even if it is not always clear whether the initiatives were political or spontaneous. In any case, the goal was to obtain and maintain the consent of the population for a long time, once the “August fever” had passed, that is, the kind of collective hysteria which succeeded the declaration of war. Outside the organized frameworks, the propaganda coming from below in a way involved many actors: journalists above all, but also scientists, artists, writers, poets, painters… We could add the public services such as the schools and the Post Office, or the craftsmen who made innumerable objects in connection with the war. In a short time, that is to say, in July-August 1914, more than a dozen “patriotic” plays were released, some of which exploited the folk memories of the 1848-49 war of independence. Yes. Their action was the most massive, but the intellectuals in general, and for the most part, voluntarily embarked on the justification of the war and the spreading of the bellicose policy of the government. As in other countries at war, it was necessary to proscribe all criticism and debate; people were swearing only by the necessity of national unity and the acceptance of sacrifices. Among the young mobilized artists, the attitude is often marked by denial: these people start to glorify the action and to denigrate, if not to hate, their own previous intellectualism, as the Hungarian historian Eszter Balàzs observes. His recent work on propaganda is particularly suggestive. This author also observes that it was the bellicose intellectuals who created the myth of massive and generalized enthusiasm, extrapolating from the climate that prevailed in August 1914; the purpose was to pretend that the war originated from the general will. Recent research tends to show that warmongering predominantly characterized the middle classes, and that there were notable differences between cities and the countryside and between different social categories. What means have been employed in this campaign of propaganda for the war? Here also there is something familiar from one country to another. As in all belligerent states, newspapers are the main instrument of propaganda. In Hungary, the major national dailies (Budapest Gazette, The Journal, Hungarian Journal, Pest Gazette) and other periodicals (Evening Journal, Latest News, Petit Journal) drew between 160 and 180 thousand copies. In 1872 there were only 65 professional journalists and ten times more in the 1880s. Author of a thesis on war correspondents, Éva Gorda notes that in the years preceding the conflict, and even during the war, the Hungarian public considered that only what was printed could be believed. Cinema and radio already existed, but people were convinced that only newspapers were credible. This finding gives a good idea of the influence of the press. At first, the tone is exalted; the bad news are ignored, then the censorship goes into action and empty columns appear. They are filled with advertisements or horse race results. In any case, the means that is the print goes across virtually all other forms of propaganda. And so, the newspapers of the national press reproduce the texts of the conferences organized within the framework of the Central Committee of Relief. The initiative of these conferences came from the owner and editor-in-chief the Budapest Gazette, Eugène Rákosi (no relation with the future Stalinist dictator Mátyás Rákosi). 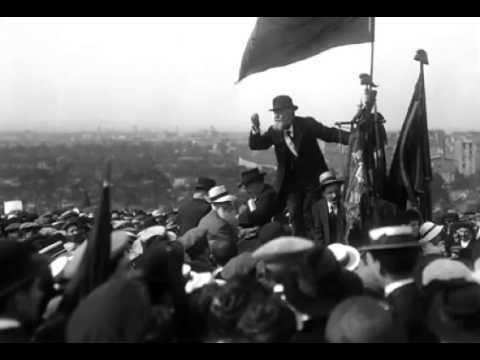 Significantly, the series was inaugurated by Ottokár Prohászka, an anti-Semitic bishop and fierce enemy of the revolutionary workers’ movement. The first session was held on November 8, 1914 in a large luxury hotel, attended by 300-400 people, from the “cultured society” of the middle and upper classes: only people accustomed to vernissage, parties and receptions, mostly beautiful ladies and beautiful girls. What were the themes of the speeches of this first conference? The bishop presented the conflict as a spiritual test, before developing the benefits of war and the inconveniences of peace: it creates a “soft and sentimental culture”, he said, while during the war sacrifice in action replaces the debates that divide society. For the holy man, even mourning, instead of remaining selfishly individualistic, must preserve its dignity in front of the image of the hero. This will be one of the favorite themes of the speeches. The successive conferences speak tirelessly and with exaltation of heroism, of “moral purification”, of virility, of the “miracle of enthusiasm,” as so many sublime qualities generated by the war; there are some who praise war like poetry, claiming that “war is in itself poetry”! How edifying! You mentioned another organization, the “National Military Rescue Committee”. What were its activities? The National Committee of Military Relief was both a social welfare organization and a propaganda tool. Its activity was spread across the entire country through conferences organized in the main cities; and as in the previous case, newspapers contributed by publishing announcements and reports. The first meeting was held on December 8, 1914. The speaker was the Defense Minister himself. “In his splendid uniform with his decorations,” he spoke “with a noble pathos and a deep conviction” to electrify his audience: “statesmen, generals, wonderful women” as the report wrote. The minister called for “self-mobilization”, wishing that every citizen become a soldier. The following lectures were also held in front of a female audience for the most part. However, the belittling of the effeminate culture was often found in the speeches, the speakers having glorified above all the virile culture which favors action. Did this simplistic worldview claim to convince the general public? A large number of universities, colleges and high schools also set up their own war conferences. The Faculty of Sciences of Budapest organized them on the German model and at a weekly frequency, from the end of 1914. The sessions were free and welcomed a large public. To convince the youth and the general population, each professor explained the justification of the war from the point of view of his discipline. Among the themes discussed, we find the cult of the will, the condemnation of individualism, the superiority of the central powers, or the need to defend the cause of European civilization that the treacherous alliance of England and France with barbarous Russia had let down. From 1916, when human losses appear in all their enormity and the hope to win the war is slipping away, we can speak of an accentuation of the role of the State and the “Military Quarter of the Press” in the Propaganda. Planned as early as 1909, this body achieves its complete organization. As I said before, it was a complete propaganda machine with its twelve units. It had 400 people in 1914 and 800 in the summer of 1918; the staff included writers, journalists, painters and cartoonists, sculptors, photographers. What was the message conveyed by this really special team from the Austro-Hungarian “civil society”? War correspondents had to talk only about success, the articles they made for newspapers were first going through censorship. When they were allowed to visit the front, it was on the occasion of success and without ever being able to witness the fighting; they could see the preparations and the battlegrounds when they had been cleansed. They had to glorify the heroism of the soldiers, the skill of the officers, and the military organization as a whole. It was the same for the artists. After visiting the front, each time they had to present a series of paintings and drawings, for exhibition purposes. The artists also produced postcards, colored lithographs, bookmarks, miniature images, diplomas, medallions, platelets, etc. With selected paintings, a first exhibition took place on January 6, 1916 at the National Exhibition in Budapest; the public could see 802 war-inspired works by 51 artists. One of them will say that it was necessary to avoid the representation of horrors, the wounded lying in their blood, the heap of corpses, all the subjects unfit for the glorification of the war. Yet, at the time, pacifists also had their own media outlets… Were their arguments and slogans not as effective? The Social Democratic Party represented the main force of opposition to the war… as long as war did not break out. As a mass political and trade union organization, it used Népszava (People’s Voice), a broad and deep influence in the working class. Following the instructions of the Second International, it displayed an intense pacifist propaganda, especially during the month from the bombing of Sarajevo to the declaration of war. Its newspaper explains that the attack is the consequence of the Austro-Hungarian imperialism and the nation-wide oppression which weighs on the Serbs of the monarchy; it considers the general strike by claiming the international solidarity of the workers, and denounces the “parliament of classes” where all the parties voted for the war. The denunciation is also aimed at the bourgeois press, entirely pro warmongering. An editorial appears quite premonitory when it warns that war could lead to social upheaval and the collapse of the monarchy. Apart from the Social Democrats, and outside the National Assembly, it was still the radical bourgeoisie who stood with determination against the war; only feudal and banking circles had an interest in fighting with Serbia, they said. They believed that together the Social Democrats and certain sectors of the bourgeoisie could prevent the imperialist war. But as soon as the conflict broke out, they behaved like the social-democratic apparatus. Did all the humanistic voices get extinguished by “realism”? There were only two intellectual groups that would retain their active antimilitarism. On the one hand were the writers and artists gathered around the militant unionist and avant-garde painter Louis Kassak, who stood out from the bellicose mood. Kassak published a magazine titled The Action then, after it was banned, the magazine Today. His group, which organized conferences for peace, reacted strongly when the Social Democratic Party abandoned its pacifism and espoused the bellicose cause. How were the belligerents able to impose themselves against the arguments and slogans of pacifists? The power from the beginning gave credit to the idea that pacifists cut themselves off from the nation. With the coming into force of the emergency measures, the Reform Party and its newspaper were in danger of disappearing, while the leaders wanted to save the apparatus at all costs. But instead of being silent, they began to support and justify the imperialist war; they advanced the most absurd arguments, such as the defense of democracy or the conquest of all sorts of workers’ rights on the battlefield. The second group that did not compromise on its antimilitarism was the Galilee Circle. This anticlerical society of free thought pursued since its foundation in 1908 an activity turned towards the acquisition and the diffusion of scientific knowledge. When most of its leaders had to go to the front, a younger second generation took over; the team also included more women than before. From the outset, the Circle placed at the center of its work the economic and social significance of war; it regularly organized conferences on peace, inviting the most prominent leftists, radicals and social democrats. This program was often disrupted by bans and military events. The anti-militarism of the Circle was based on Marxist ideas, but it drew directly on the work of Gustave Hervé, called an apostle of antimilitarism by the poet Ady. After his spectacular turnaround, Hervé became a foil, and the flag bearer of the fight against the war will be Jean Jaurès. In 1915, the “Galileists” fervently commemorate the first anniversary of the assassination of the French socialist leader; it was an important moment of their demonstrations for peace. From 1916, the Circle starts offering Russian lessons, the old motto “Learn and teach” is replaced by “Let’s talk Russian too, let’s also act Russian”. From 1917, the Galileists regularly participate in the anti-war demonstrations of the unions; the one of November 17, 1917, they were the main organizers. Then, under the guise of their seminars and conferences, they undertake to smuggle antimilitarist leaflets on the frontlines; they also have pseudo-medical examinations attesting that men belonging to the left suffer from tuberculosis, to avoid their departure to the front. In January 1918, hundreds of leaflets were scattered and placards stuck on the walls around the barracks of Budapest. For the most part, the texts called for transforming the world war into a civil war. The police investigation led to the arrest of about thirty Galileists, their Circle was closed, the archives, the library, the cash register are confiscated. After eight months of pre-trial detention, two activists were sentenced to two and three years of imprisonment. They would be released before that by the revolutionary mob of October 30, 1918. Were popular reactions against the war important in Austria-Hungary? What difficulties did they face? To speak of popular reactions would be a big word. What is nowadays called, with a little pedantry, the political and intellectual elite, held the upper hand, and in their immense majority they flattered bellicose sentiments, glorified and justified the war. And on the occasion of the centenary, as far as I know, peasants, workers and other popular categories do not appear through the innumerable seminars. It is by chance that I come across this sentence from the Hungarian historian Andras Gerö: “the public opinion of the country is located rather on the side of the party of peace”. Concretely, the popular reactions were manifested against the consequences of the war: the privations, the requisitions, the militarization of the factories. In this fight, they were even supported by the reformist bodies, which was sort of ambiguous. The trade union and social-democratic press, for example, was free to denounce speculation, scarcity and, in general, capitalist greed, insofar as this propaganda was in the interest of a better functioning of the war machine. But that wasn’t meant to go too far. As soon as certain strikes or hunger riots threatened the bellicose cause, the repression came into action in an exemplary manner, i.e. military. In the case of organized movements, it was common practice to send the leaders to the front; but sometimes the authorities hesitated to resort to this method, fearing that the absence of workers’ cadres would even be more dangerous. What was the impact of the October Revolution, especially on the phenomenon of desertions at the front, and generally on the reconstruction of the anti-war movement? The military authorities expressly pointed out the effects of the Bolshevik Revolution on desertions. 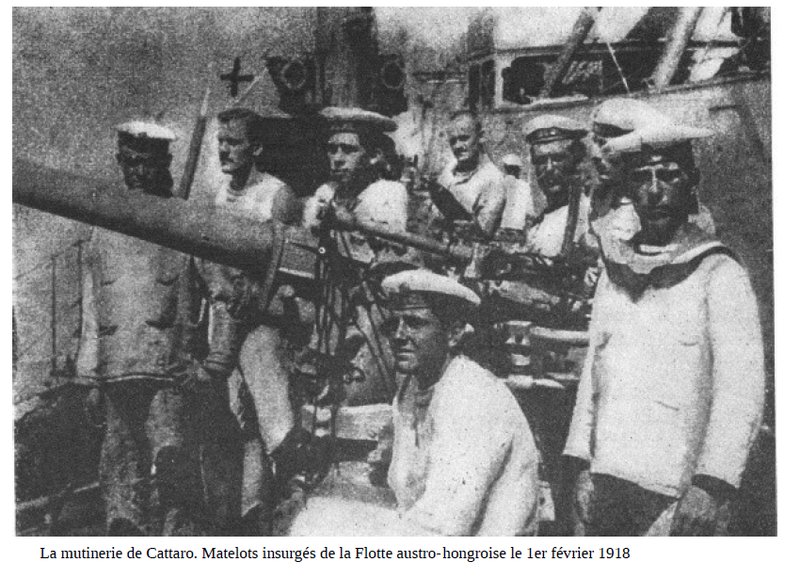 This event also resulted in the massive return of prisoners of war after the Treaty of Brest-Litovsk in March 1918. They brought with them the memory of the fraternizations and the feeling that the war was over, while the army was counting on those contingents to reinforce the Italian front. To this end, it proceeded by various methods such as internment, selection or rehabilitation. In fact, from the abdication of Nicholas II onward, the fraternizations happen on large scale. During Easter, they affected the entire Eastern Front. Spontaneous movements were then encouraged by the Soviet power. The return of former Austro-Hungarian prisoners of war will be a powerful catalyst against the continuation of the war, and all the more so as the monarchy and its armies are exhausted. In the mutinies that are numerous at that time, there are constantly leaders and spokespersons contaminated by the ideas of Bolshevism, as it was then called. On November 11 and 13, 1918, Charles IV renounced his title of Emperor of Austria and King of Hungary. It is the dismemberment of the Austro-Hungarian Empire. Mihaly Karolyi becomes the first president of the People’s Republic of Hungary, but the institutional crisis continues. What is the social context at that time? The war has put the country in a terrible situation. The economy is disorganized, a good part of its mining and industrial resources is lost with the removed territories; production collapses, unemployment and inflation hit the working classes hard. From the regions of the former kingdom that have become “successor states” are flocking hundreds of thousands of refugees toward Hungary, now reduced to one-third of its former size. Many come from the old administrative apparatus and police, who flee the revenge of the nationalities that they had not always treated with amenity, and that is putting it kindly. Due to lack of housing, they are crammed into wagons; a fair number of them will go to fill the ranks of the white terror and the far-right movements of the inter-war period. In February-March 1919, the social crisis drives workers to action. The occupations of factories increase, with the workers’ councils often taking charge of their leadership. On March 17, faced with the facts, the government decided to create a ministry in charge of the socialization of industrial enterprises. On March 18, in the great industrial center of Csepel, five thousand workers commemorate the anniversary of the Paris Commune and take a stand for the immediate proclamation of the proletarian dictatorship; the next day, twenty thousand unemployed parade before the Food Supply Ministry: led by communist militants, they ask for assistance and the expropriation of the means of production; March 20 is the general strike of printers, which quickly takes a political turn. In the countryside, the poor peasants and the agricultural laborers proceed, particularly in Transdanubia, with the division of large estates, and one can witness scenes of popular justice and plunder. In many places, the inhabitants kick out the municipal administrators who during the war dealt with requisitions and other unpopular tasks. To repress these actions, the Karolyi government organized special forces headed by officers of the old army and with support from the rich peasants. In the villages, punitive raids and summary executions follow each other. This wave of repression would have claimed more victims among the peasants than anything known under the monarchy. The 20th of March signals the ultimatum of the Paris Conference, which causes the resignation of Karolyi. What was this ultimatum and what was its effect on the young republic? The ultimatum in question, known as Note Vix, is a letter delivered to Karolyi by Lieutenant-Colonel Fernand Vix, head of the Entente’s military mission in Budapest. It is an injunction formulated by the peace conference of Paris on February 26, 1919, in prelude to territorial claims. Hungarian troops still present east of the Arad-Nagyvarad-Szatmarnemeti line (Arad-Oradea-Satu Mare) were ordered to retreat a hundred kilometers to the west, almost to the Tisza River. In the evacuated territory, which corresponded to the whole eastern part of Hungary, the Allies envisaged the creation of a neutral zone 40 to 50 kilometers wide, including the cities of Debrecen, Szeged and Gyula; further east, the Romanian royal army would occupy the ground. It happens that in February this army has not yet reached the limits of Transylvania, which its government had claimed, in accordance with the secret agreement concluded in Bucharest in August 1916 with the Westerners. In support of his demand, Prime Minister Bratianu exposed in Paris the danger of Bolshevism, threatening at once Hungary, Ukraine and Bessarabia. The Allies must provide support, he said, if they want Romania to remain a stronghold against Bolshevism. The idea of ​​the Romanian occupation and the creation of a neutral zone was particularly welcomed by the French General Staff, especially since Marshal Foch had just finalized his project of intervention against Soviet Russia; and in this perspective, the Polish and Romanian armies seemed to have a better operational readiness. The birth of the communist republic is therefore directly related to this context. Karolyi having abdicated, the new regime takes ownership, in the midst of a thousand difficulties, of the war against the Czech and Romanian armies. Workers mobilized in a Red Army have been successful in reclaiming Upper Hungary (present-day Slovakia), while Romanians remain blocked by the Russian Red Army offensive in Bessarabia. The junction between the two Red Armies seems possible. But following two consecutive summons from Clemenceau, the Hungarian troops must stop their operations to withdraw on the borders reshaped by the peace conference. In return, the government of the Councils believes that it would be officially recognized and that, according to the Clemenceau second note, the Romanians would withdraw from the territories they occupied east of the Tisza. Neither of these promises will be kept. Giving up the territories reconquered at the cost of difficult combat demoralizes the Hungarian Red Army and, on their end, the Romanian troops far from withdrawing, cross the Tisza, engage in looting, occupy Budapest and ensure the advent of the counter-revolutionary Horthy regime; many communists will be interned in Romanian camps near Bucharest as a result. What was then the reaction of the countries of the Entente to this peaceful revolution? The coming to power of the Communists caused a big surprise to the powers of the Entente. At the peace conference, there is now a Hungarian question. On the 6th of April, General Franchet d’Esperey expressly asks Clemenceau for military intervention; this because they dread the spread of Bolshevism. In consulting the French press at the time, I came across a snippet of l’Est Republicain (Republican East) July 23, 1919, which reproduced an interview that General Pellé, head of the French military mission in Prague, had given the Nouvelle Presse Libre of Vienna (New Free Press), and which reflected the state of mind of the Paris Conference. In his capacity as head of the military mission, General Pellé will be the main actor in the creation of the Czech army, of which he becomes the first chief of staff. He sets up military schools and training centers for the development of this army. It is he who will lead the counter-attack to block the advance of the Hungarian Red Army in Upper Hungary. 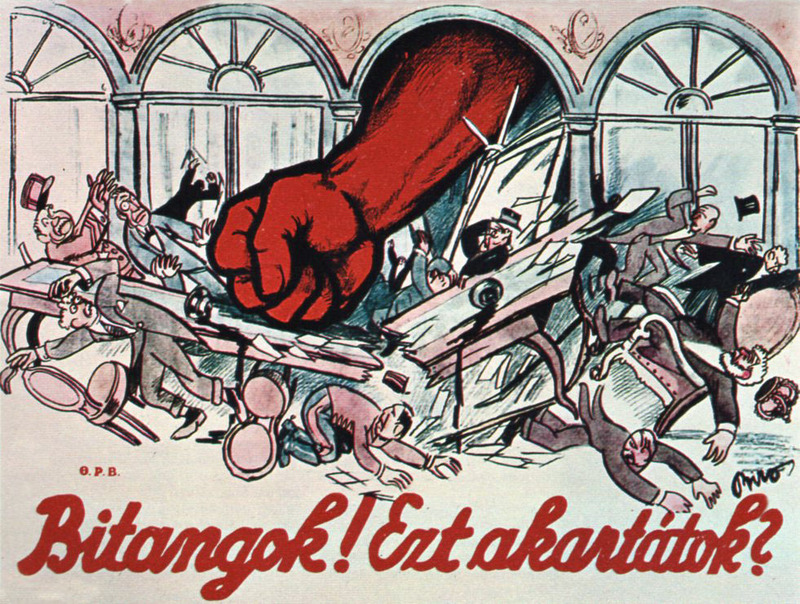 Contrary to the terrible situation in Germany, the Hungarian Social Democracy and the Hungarian Communist Party were founded in one and the same party, the Socialist Party of Hungary. How would you describe their relationship inside the party? At the time of the unification, the Social Democrats had between 700 and 800,000 adherents, and the communists about 40,000; an English book published in 1967 indicates 4000 to 7000 communist “militants”. In any case, they were weakly organized, they were not really rooted in the masses and did not have the majority in the Councils of workers, soldiers and peasants. The merger was concluded without discussion in the party. A reporter will tell the Communist International Executive Committee that most leaders were hostile to it. In particular, former prisoners of war, known as “graduates of the October Revolution,” disapproved of the liquidation of their Leninist organization. Kun, for his part, claimed that the communists were the only beneficiaries of the merger. In fact, the latter were drowned in the mass of the Social-Democratic Party, which, in addition, has lost a lot of its worker character since October 1918, because of the arrival in the party of a crowd of elements of the petty bourgeoisie. On the other hand, the best communist militants were absorbed by the Red Army, which contributed to the weakening of the political importance of their party. What is finally to be noted is that the reformist apparatus could always rely on its previous position, on the positions it has retained in the party, in the unions and various associations, whereas the Communist Party did not have time to put in place the necessary relays in the working class. The sympathy of the masses could not outweigh the influence of the former reformist leadership, which was quite capable of rebuilding its network of officials, delegates and other leaders, all in favor of maintaining the old state bureaucracy. In your book, you quote Lenin’s message to Béla Kun on March 23, 1919, where the leader of the Bolshevik Revolution warns Kun about the mistake that would be made in case “Russian tactics” were imitated. 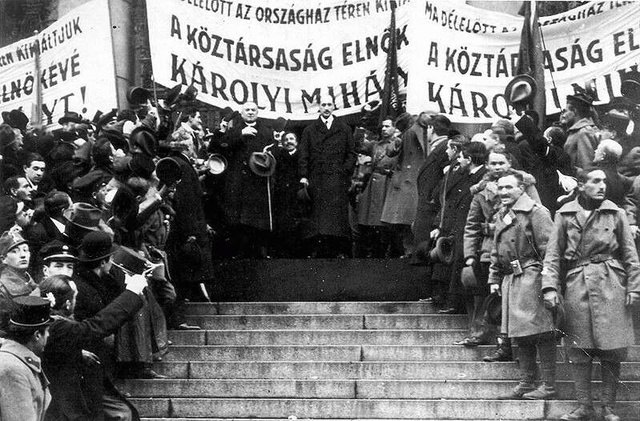 What was the specificity of the Hungarian revolution and what will be its first measures? The quoted telegram dealt with the balance of power within the government, since the merger between the two parties did not cancel out the colors of the old political affiliations. Communist leader Béla Kun, Commissioner for Foreign Affairs, was the real head of the Governing Council, but all the other posts of commissioners (equivalent of the former ministers) belonged to elements of the center and the left of the old social-democratic party; vice-Commissioners, on the other hand, were for the most part Communists. All of this, i.e., the relationship between the party born out of the merger, the government, and the head of state’s question could not be clarified due to the circumstances. As for the specificity of this revolution of March 21, 1919, it gave rise to diverse assessments by the posterity. One of the best connoisseurs of the period, the Hungarian historian Tibor Hajdu, as well as various articles and statements from the Western communist parties, theorized that the proletariat could conquer power by peaceful means; closer to historical reality, the author of a thesis on the issue, Dominique Gros emphasizes that we could not isolate the event of March 21 from its internal conditions and the state of the revolution and the international counter-revolution: more concretely, the Hungarian proletariat was armed, while the reaction had neither army nor effective forces of repression. As early as 22 March, the new regime announced its program: the transformation of Hungary into a republic of councils, socialization of large estates, mines, large factories, banks, transport companies; the agrarian reform would be carried out not by the division of land but by the creation of agricultural co-operatives. The new regime would take measures of implacable severity against speculators and their kind who profit from the scarcity and misery of the masses. 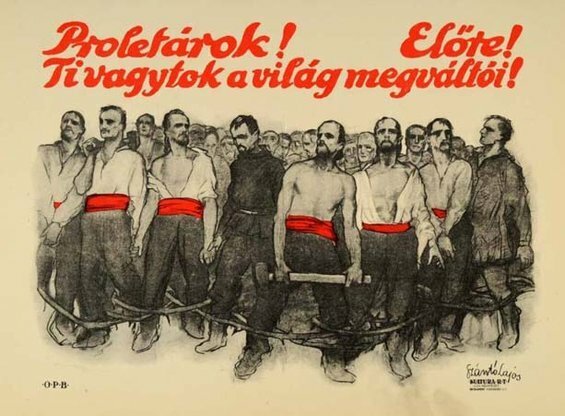 To promote the dictatorship of the proletariat and to defend the country against the Czech and Romanian invaders, the creation of a great proletarian army is announced. In the end, the experience of the Hungarian Republic of Councils will last only a short time, because the Red Army had to capitulate to the invasion of the Romanian royal army supported by the Entente. The result is Horthy’s “white terror”, which some liken to “red terror”. You warn against the “false debate” of the two terrors. Why? But given the historical context at hand, the main misconception is that it was the ruling classes who for centuries exemplified violence as a means of exercising power. The popular psyche has kept the memory of the degrading treatment of men under the lordship regime, the ferocious repression of the jacqueries and, more recently, the police violence that the Tisza team exercised all the way inside Parliament. The oppressed reacted in their turn, spontaneously, inspired in some way by these precedents. And the big butchery that the population had just known was also the business of the “decision-makers”, as they say now, and the carnage in which these people dragged the men greatly contributed to devaluing human life. Finally, again with regard to this parallelization of the two terrors, it was pointed out by Radical Party leaders, who were far from sympathizing with the Communists, that the latter were motivated by a program and a political ideal, whereas the Horthy’s people indulged in gratuitous acts of revenge punctuated by appalling tortures; their arguments were also false because, while calling themselves national, they relied on the Romanian invader, and they signed the treaty that codified the dismemberment of the country. This year closes the commemorative cycle of the centenary of the 14-18 war. As a historian and specialist of this period, what are your impressions on the presentation that was made? In May 2014, I participated in a three-day symposium organized by the University of Budapest. This experience and the consultation of various programs in Hungary (a Rendez-vous of history in Blois also focused on the Great War, with conferences in the style of “culture of war”) give me the impression that, if I consider the event from the point of view of historical work, we have dealt more with a military history than a history of war, and more with a history of elites and other decision-makers than with the history of those who had directly taken the blow of the disaster. I mean by the history of war the study of the event in all its dimensions: military of course, but also political, economic and especially social. It is this idea that prompted me to write quickly the booklet that earned me the honor of this interview with you. I would have liked to rely on research on issues such as fraternizations, desertions, the treatment and reception of the wounded, the fate of the mutilated after the conflict, the relations within the armies between soldiers and officers, the “management” of the dead, shortages, requisitions, war profits, riots and mutinies, the reception of propaganda among the people, etc. Still from the point of view of the research, what the best French academic historians of the question called in the 1980s the “cordiale connivence”, that is to say the joint action of the finance, business circles and diplomacy of the rival powers, in short, the study and “update” of imperialism has not attracted the attention of innumerable accounts. I have not encountered any work that would have raised the fundamental role of banks and the export of capital in the formation and consolidation of supranational systems, which made the war world-wide. I still have some figures from my speech at the Budapest symposium. Between 1888 and 1914 French bank loans and investments in Russia increased from 1.46 billion to more than 12 billion francs; and during the last negotiations in 1913, the French government stipulated the tsar’s obligation to build new railway lines across the Polish territories, in order to ensure the rapid regrouping and greater mobility of Russian troops. For its part, Deutsche Bank with its large companies and railway concessions in Turkey, which equipped and modernized the troops, has become in itself a factor of world war, directly threatening the lines of communication of the British Empire. On the other hand, if we admit here and there the crucial importance of the German-British antagonism, this observation is not treated on its own scale, that is to say, it does not appear as the corner stone with regard to many regional problems; it is drowned in the multitude of belligerent factors, or it appears to be stuck on the endless considerations relating to the Balkan questions. In this respect, also in France, Christopher Clark’s sleepwalkers seemed to me quite significant: the description by the menu of the Obrenovitch couple’s assassination is a real detective story, and then the reader finds himself drowning in the innumerable details of diplomatic history. As I remembered, this is not a good book, even if the factual elements are always interesting to know. If it was promoted and flattered in every way, I think it’s because of his insistence on the Serbian question, an old system of explanation trick by the little end of the spyglass, and because it has managed to ignore the primary place of Germany: an approach that the author fits well, deliberately or unconsciously, to the politically correct ideology of contemporary Europeanism. Now, considering the centenary from a memorial angle, I would like to ask these kinds of questions: why did the authors who, beyond the condemnation of Stalinism, contributed to criminalize communism did not feel the need to globalize and bring their talent to criminalize the World War and its slaughtering generals? Why did all these court experts not write their black book of the totalitarian militarized regimes of total war? Because we did invent something like the culture of war, which everyone can understand in their own way, but which, in my opinion, will serve mainly to trivialize or folklorize barbarism. What lessons should the new generations learn about 14-18? I hope your question will not make me appear as a know-it-all! As I was a departmental correspondent of the History Committee of the Second World War and the IHTP (Institut d’Histoire du Temps Present) who succeeded it, it is this period that I know more deeply, at the research and debate levels that crosses its historiography. For World War I, I would first read the classics of Marxism about imperialism; for example, the text from Rosa Luxembourg on The crisis of social democracy is brilliant. At the University (in France), the big “liberal” classic is Pierre Renouvin for the history of international relations. More recently, I consulted the Englishman Alexander Anievas, who deals with the Marxist concepts and theories concerning the origins of the war, he is inspired above all by L. Trotsky, if I remember correctly. I also consulted La Grande Guerre des Classes and followed the conference on the internet of Jacques Pauwels whom you know well. What is your view of the upheavals of the contemporary world? I have been thinking for some time that the forces that in 14-18 destroyed Europe in the name of nations are now destroying nations in the name of Europe. The supranational Europe, a work of the Catholic Church and the banks, is in the first place a machine for destroying public services, which, since antiquity, are consubstantial with the very notion of civilization. Free and undistorted competition is the war of all against all, a form of barbarism. The so-called union has revived hatred between peoples, often giving birth to the nationalism of saddest memory in Europe. But remembering this inscription of the Monument des maquis de l’Ain: “Where I die reborn is the Fatherland”, I consider that pacifists and lucid internationalists should not leave the nation to nationalists and chauvinists. You cannot really put yourself in the shoes of another nation if you have not internalized your best traditions. Cosmopolitanism too, so often mentioned, is only the tree that hides globalized and ferocious capitalist disorder: the fox has become freer in the freest henhouse. And wanting to adapt the political order of his country to the needs of globalized capitalism is a naivety if not a monstrosity. Free movement, school exchanges and other meetings are obviously a good thing, but young people should also understand that war is not about human feelings and passions but institutions and the economic and social needs of the order, or rather of capitalist disorder. Behind the attack on Syria The 2017 French Elections: A Grim Farce Fascism’s Face-Lift There’s no ‘red scare.’ So what is right-wing violence about?